If there's a heaven on earth, I've found it here, in Colorado. Standing at the edge of a snow-pocked rocky slope, Susan Carothers set down the canvas-covered box holding her small view camera, three glass plates, and black hood, and topped it with the folded tripod. She examined the landscape and let out her breath in a long, contented sigh. High-mountain grasses rippled alongside the Arkansas River. A few spindly aspen and fir that had escaped the axes of prospectors and loggers hugged the riverbanks. Meadows beyond raced across wide spaces to bow at the toes of Massive and Elbert, the tallest peaks in Colorado. The new train track glinted below. Silent. Untraveled. It paced the base of the slope at a cautious distance and sent out a splinter of a side track where two railroad cars waited their turns to travel on. A trestle carried the main line across the gulch and river, from east to west. 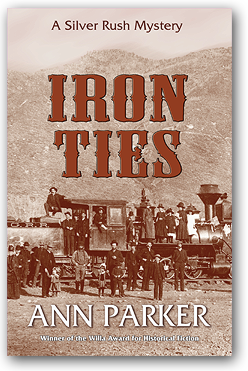 Several miles up the valley, out of sight beyond the bend of the ridgeline, laborers toiled over wood ties and steel rails. Foot by foot, they were building the road of the iron horse, bringing it ever closer to Leadville. Susan turned to the north, squinting at a cluster of abandoned charcoal kilns nestled at the mouth of the gulch. The morning sun cast their elongated beehive-shaped shadows toward the river. With a professional photographer's eye, Susan translated the scenery's greens, blues, and browns into the blacks, whites, and grays of a photograph. She turned her back on the kilns and trestle, eyeing an abandoned shack and mining portal situated on a ledge halfway across the steep terrain. The ledge would yield panoramic views of the mountains. Views that would sell well at her studio in Leadville. She scowled, thinking of the saddle horse and burro she'd hired, now tied off on the brushy bench behind her and sheltered in a copse of scraggly firs. All the coaxing and tugging in the world hadn't convinced the burro, burdened down with photographic equipment, to take so much as a step onto the talus. Where the loose rubble ended and the slope steepened to near vertical, she could see a well-defined trail, cut into the rock, leading to the shelf and cabin. She brushed at the knee-length skirt covering the bloomers of her Reform dress and pondered her next move. I'll cross the slope and set up the camera in the cabin so that it looks out the window. If it rains, the equipment will stay dry. Susan glanced up at wispy clouds. A year and a half of living and working in Leadville had impressed upon her how fickle weather could be in the Rocky Mountains. Over the course of an hour, the innocent blue sky might transform into a thunderstorm of Wagnerian intensity. She bent down, gripped the tripod and the handle of the heavy camera box with firm resolve, and stepped forward, trying not to think what would happen if she lost her footing on the loose rocks. By the time Susan arrived at her destination, she was out of breath in the thin mountain air. The shack squatted on the dusty bench, facing a mine portal shored up with timber. She wondered if the former occupants had had any luck or whether Disappointment Gulch had lived up to its name. Ah well. I'm prospecting for scenery, not ore.
She entered the shack and looked around. Hard-packed dirt floor. Rough timbered shelves along one wall. A window, long emptied of glass, framed a mountain vista that echoed her vision. Susan smiled and lowered tripod and box to the floor. Eager to get to work, she removed her coat and hung it on a crooked nail in the wall. It took an hour to set up the camera at the window. Satisfied at last with the placement and the light, Susan knelt on the dirt floor, rustling through the box for a replacement to a plate holder's stripped screw. The wind paused, and the river's whisper was broken by the sharp clip-clop of a horse. Resting a hand on the rough timbered window frame, Susan looked down at the railroad track, nearly a hundred feet below. A man dismounted and, reins in hand, glanced up and down the track. Susan noted his ramrod straight bearing, and his military-style cap and greatcoat—faded blue? Or gray? A soldier? He walked to the siding and the cars, examining the rolling stock. He then headed away toward the trestle and the kiln field. Susan considered, then shrugged, deciding that he was probably on railroad business. She turned her attention back to her camera, removed the lens cap, made the exposure, and replaced the cap. Before she could remove the plate, the soldier reappeared without his horse, cradling a box in his arms. He crossed to the siding. Susan debated whether to call out and make her presence known. He opened the box and extracted a tube, the length of a man's forearm. And red as danger. Susan sucked in her breath and retreated a step into the shadows. She'd lived long enough in the mining town of Leadville to know what that tube held. More powerful than black powder, by far. So dangerous that the railway companies refused to transport it, leaving muleskinners to haul it by freight wagons over the high mountain passes to Leadville and the other mining towns. The soldier methodically placed two, four, six cartridges beneath the railroad cars and attached blasting caps and long fuses. Susan watched in horror. He's going to blow up the cars! She ran to the shack's entrance and stopped. There was no way to retrace her steps across the slope without being visible from below. The best course of action, she told herself, was to wait until the fuses were lit and then to run for the mine portal. When the giant powder exploded, there was no guarantee the shack would survive the flying debris. Heart pounding, Susan returned to the window to see another rider approaching from the north, from the direction of Leadville. The soldier must have seen or heard the rider as well. He stepped between the two cars, hidden from the rider's view, but still visible to Susan. After some scrutiny of the approaching horse and rider, he looked up in Susan's direction, removed his cap, and waved it. He's seen me! Panic curdled in her stomach. She shrank against the cabin wall before logic whispered that the friendly wave was not meant for her. For whom, then? A vision of the ridge above her rose in her mind like an image materializing on a photo plate—steep slope topped by a jagged assembly of outcrops, protrusions. Many places to hide. Feeling trapped between the men below and possibly more above, she peered around the window frame to see horse and rider ease into a trot, finally stopping by the soldier. The soldier replaced his cap and stepped out from between the cars. He sketched a perfunctory salute to the newcomer, who nodded back and leaned forward over the saddle, examining the half-full box and the fuses snaking across the dirt. The wide brim of the rider's slouch hat flapped in the breeze like the wings of a buzzard trying to take leave of the ground. His nondescript clothes and horse were dirt-brown. Man and mount seemed nearly invisible, calculated to blend into the landscape. The two men talked. Distance and the river's murmur hid their words. The soldier turned away, gesturing at the train cars. The rider pulled his revolver, aimed it at the soldier. The soldier turned back to the rider. Froze. Holding one hand up in surrender or supplication, he reached slowly to the inside pocket of his jacket, pulled something out. He held it out, wadded in his fist, as his voice rose in anger, vying with the river's relentless song. "Damn you, Eli! The oath...years ago. Kill the general...for this!" The cloth in his hand unfurled into a long strip. The rider, Eli, shouted back, "...turn you in or kill you, your choice!" The soldier's ramrod posture dissolved. He slumped, lowered his hands as if defeated. The cloth fell from his grasp in a rippling wave to the ground and he crouched, the flicker of sun on metal, a revolver now in his grip. The two guns fired, nearly simultaneous. Eli fell from his saddle in a scuffle of dust. The soldier also crumpled to the ground. Eli shot him again and again, until the twitching stilled. The soldier's dropped cloth, pushed by the wind, tumbled along the siding into the grass, colors flashing red, blue, white. Eli sat up slowly, holding his leg, attempting to stop the flow of blood. Another gunshot boomed through the shushing wind. Not from below, but from the ridgeline above. Eli clutched his jacket, the brown cloth blooming with red. His shout rang clear: "I won't tell, I swear! Don't—"
His yell was cut off by a second report from the ridge, a thread snapping under a scissors' blades. Susan sank to the dirt floor, hand to mouth, fighting nausea and fear. The wind briefly gained the upper hand, rattling the shack, mingling in her ears with her terrified sobs and the staccato pounding of her heart. Suddenly, a new voice sounded from the direction of the tracks. "Je-sus! What happened?" The response floated down from above her, full of anguished rage. "You were on lookout, dammit! He died because of you!" Again, from the ground: "I was tryin' to catch his horse. Fool animal got away. Je-sus. This is Eli, from town!" "We gotta finish the job! The way he planned!" "Finish it? There's no reason now—"
"Wait! Wait! I've got to move them. We can't let anyone tie this to us." Susan rose, trembling. I'll stick to my plan. Should I peek out the window—? "On three!" shouted the man below. "One!" His voice was moving away. There's no more time! The certainty of it chilled her in the dank cabin air. "Two!" His voice had retreated further still. She moved to the door, gathered herself for the last-second sprint. The explosion from the tracks, she expected. But not the one from above. The ridge top ruptured with a roar. The sound buried Susan's scream as she raced for the mine portal. Rocks and dirt thundered down around her. Mere steps from the portal, pain—instant, intense—blasted through her head. She fell. Crawled the last few feet into the mine entrance. Collapsed into darkness. Below, the dead men's horses, wandering by the river, bolted and ran.